In order to borrow materials from the library, all patrons must present a valid MSUM library card or equivalent, based on Patron Type (see below). No other form of identification can be accepted. See Patron Types below for more information. Guest Passes are available for computer use, including use of databases onsite. Speak with library staff to obtain a Guest Pass. If a patron places a hold on an item that is already checked-out, they will receive an email at their mnstate.edu account once it is returned and becomes available. It will be held at the Main Circulation Desk for 10 days. If a patron places a hold on an item that is not checked-out, staff retrieve the item and place it behind the Main Circulation Desk for 10 days. Once an item has been retrieved, the individual who placed the hold will be notified via their mnstate.edu email. Distance education students should request items through interlibrary loan (ILL), not by placing holds. Once the ILL form is completed, enter a note specifying that their item is for "Distance Education." For detailed instructions, see HERE. If you are unable to place a hold, please contact a librarian at 218.477.2345 or email: refdesk@mnstate.edu. Most items can be renewed twice. Items can be renewed in person, over the phone, and online. Contact the Circulation Desk to renew: 218-477-2355. 1. Log into your account from the library's website using your StarID and password. 2. Select the Loans tab and click on Renew by the item(s) you would like to renew. Materials may also be renewed in person at the Library's Main Circulation Desk, or by phone: 218.477.2355. Renew ILL materials as above. After submitting a request, continue to check your ILL item's status to ensure that it has been renewed. Submitting a request does not guarantee renewal of ILL items. If you have questions about renewing ILL items, please call the Interlibrary Loan Office at: 218.477.2924. All borrowers are responsible for returning library materials by their due date. If your permanent address changes, it is your responsibility to inform the Library as well as the Registrar's Office. Due-date reminders are sent to all MSUM affiliated patrons using their MSUM email address. Overdue email notices for most materials, including ILL items, are sent the day an item is due, 7 days after the item is overdue, and 14 days after the item is overdue. Overdue email notices for Reserve items are sent more quickly depending upon the item. When library materials have not been returned three weeks after the first notice, a bill is sent. This bill includes a replacement charge for each late item (typically $45.00 per item) plus a $15.00 per item non-refundable processing fee. If overdue materials are later returned, all replacement charges are forgiven. However, processing charges cannot be refunded. Fines for most overdue reserve items are $.50 per hour. Fines for 3-day and 14-day reserve items are $2.00 a day. The maximum fine for a reserve item is $6.00. If these items are kept long beyond their due dates and times, patrons may be charged a $15.00 per item fee. MSUM Students, Faculty, and Staff: Your active Dragon ID is required for access to all Library services. Please carry it with you any time you visit the Library. If you lose or damage your ID, a new one can be obtained at the IT Help Desk, at LI 122. MSUM Alumni: Upon graduation, alumni can request an MSUM Alumni VIP Card from the University's Alumni Foundation. This card grants the same borrowing privileges to alumni as those given to Community Borrowers, except that MSUM alumni are not charged a yearly renewal fee. Individuals interested in applying for a Community Borrower card must bring a valid driver's license or other government issued ID as well as a $20 fee to the Library's Main Circulation Desk where they will complete an application. Once their application is approved, these patrons will receive an active library ID card. 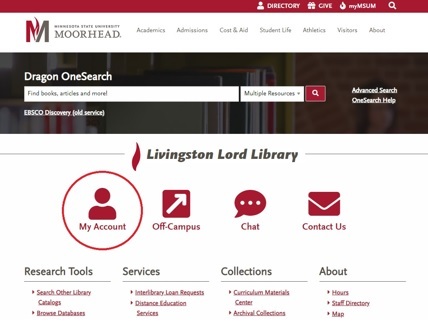 ​Other Affiliated Patrons: Students, faculty, and staff formally affiliated with North Dakota State University (NDSU), Concordia College, Minnesota State Community & Technical College (M|State), and North Dakota State College of Science (NDSCS) may present their active institutional ID to make use of the Livingston Lord Library. Please check at the Main Circulation Desk for more information.